I wanted to take one last road trip before I moved to Austin. By then, I had quit my job and had some spare time to relax and do a little traveling. I drove up to Superior and then decided to take Highway 2 in Northern Wisconsin to the UP border. Highway 2 does seem just like being in Canada so it was kind of like driving up the North Shore. My buddy Jake and I always joked about going to Eagle River, Michigan, as it was one of the most northern points in the UP. I drove up to Eagle River and then went a bit further to the end of Highway 41 in Copper Harbor. There was a lot of snow on the ground, even though it was late April. In some places, it was still higher than the garage doors. I turned around and was very tired so I stopped for the night in Calumet, Michigan. 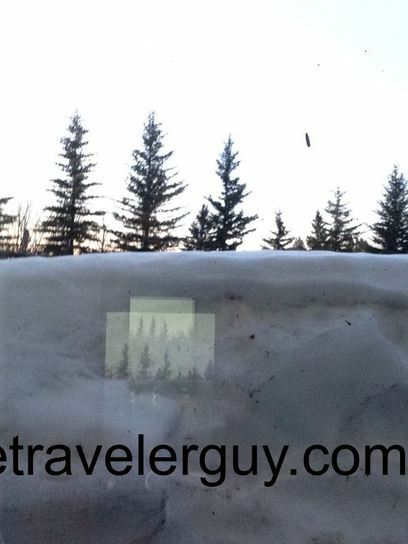 The snow banks from the plowed snow was still very high outside my hotel window. I got a good night’s sleep and then headed back down to Marshfield. Seeing the South Shore of Lake Superior was cool.